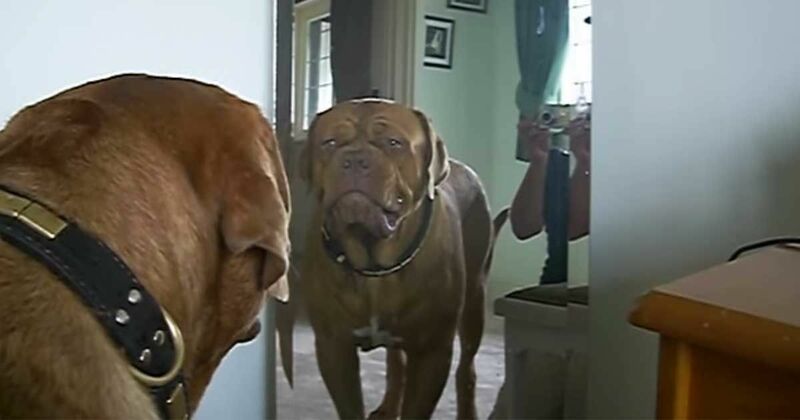 Kane the dog walks up to a mirror and is confronted with someone he wasn't expecting. He tries a few intimidation tactics to scare this strange dog away, but it seems that Kane's adversary shares his same stubbornness. If you have pets, you've probably wondered whether or not they recognize themselves in the mirror. The act of recognizing one's reflection requires a level of self-awareness that many animals simply don't possess. In fact, even humans are not born with this ability, and generally begin to recognize themselves in the mirror when they're around 18 months old. According to VetStreet.com, the group of animals with this type of cognitive ability only includes "higher primates, dolphins, orcas, elephants, and, surprisingly, European magpies." Of course, that's not to say that dogs are not intelligent or have no understanding of their bodies. Rather, their sense of self-perception manifests in a different way. The reason why dogs don't pass the mirror test is that they rely on senses besides visual perception, like smell, to learn about the world around them. Since reflective surfaces do not emit a scent, dogs do not gather information that they consider important. Watch Kane's interaction with his reflection in the video below and, as always, share your thoughts with us in the comment section. Has your pet had a similar reaction to his or her reflection?